Bari is a port city on the Adriatic Sea, and the capital of southern Italy&apos;s Puglia region. Its maze-like old town, Barivecchia, occupies a cape between 2 harbors. Surrounded by narrow streets, the 11th-century Basilica di San Nicola, a key pilgrimage site, holds some of St. Nicholas&apos; remains. To the south, the Murat quarter has stately 19th-century architecture, a promenade and pedestrianized shopping areas. 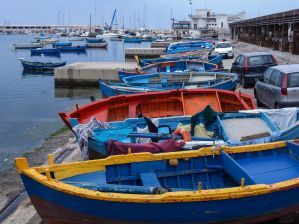 Bari is a historic but forward-looking town with a high percentage of young people and migrants lending it vigor. With grand boulevards and a good nightlife scene, Bari supports a large university, an opera house, and municipal buildings that shout confidence. The second-largest town in southern Italy, Bari is a busy port with connections to Greece, Albania and Croatia, and sports an international airport with connections to much of Europe. How much do hostels in Bari cost? Where are the best B&B's and Hostels in Bari? The original and the best hostel experience in Bari. Olive Tree is a highly rated and favorite destination for backpackers staying in Bari. Just a 7 minute walk from Bari Central Train Station it is perfectly located. The young, friendly staff are from Bari and will do everything possible to make your stay a memorable one. The rooms are bright and spacious, mattresses new and comfy, and the guests kitchen modern and fully equipped. Each guest has a large locker with locks provided at reception free of charge. The large sunny terrace is a great place to meet other travelers and just chill out. Olive Tree also organizes tours to Alberobello, Polignano a mare, Matera and Altamura. Free breakfast, City Maps, Wi-Fi, and linens are included and towels and bicycles are available for hire. This guesthouse is a warm and cozy place in the center of Bari, 3 blocks from the railway station and a few blocks from the beautiful Adriatic Sea. They have 4 double/single rooms, dorms (with bunk beds), with shared bathrooms and kitchens. The private double and single rooms are in one apartment 400 meters away. Free coffee and tea are at your disposal and there are security lockers that are free of charge. The kitchen is fully equipped if you want to cook yourself a delicious meal. You will always find olive oil from the region to enjoy in the kitchen! The bathrooms have fresh, clean towels and shampoo for you to use. Free City Maps, Wi-Fi, towels, and linens are included. The Guesthouse City Center offers a fully furnished, quiet, and comfortable house with free Wi-Fi and a balcony for guest to enjoy. The facility has large rooms and is located in the city center close to the sea. It is possible to use the kitchen for free only if staying for a long period. If you are a guest of 2/3 nights, there is a small fee to use it. Washing machine is available for an extra fee as well. The Guesthouse is situated next to the Old Town and close to Petruzzelli Theatre and only 10 minutes by foot from the main railway and central bus station. It is next to the bus stop for easy access to transportation. Free Wi-Fi and towels are included with your stay. B&B Bella Bari offers newly refurbished, spacious, private rooms each with their own private bathroom, free and fast Wi-Fi, and a rooftop terrace. The young Australian/Italian owners offer friendly advice, information on city tours, ferries to Greece and Croatia, and day trips to nearby Alberobello, Matera, and Lecce. Little Olive Tree is nestled right in among the locals in this very quiet, authentic pocket of Bari Vecchia. Narrow cobbled streets lead you around a blissful maze of this medieval city- unchanged after more than a thousand years. With women making orecchiette (fresh pasta) in front of their homes and small alimentari selling local specialties like focaccia, cheese, salami, olive oil, and wine- this is an experience you are unlikely to find anywhere else in Europe. Little Olive Tree is located just 2 minutes&apos; walk from the Basilica of San Nicola, 5 minutes&apos; walk from the port and cathedral, and 20 minutes from the central train station. Free breakfast, city maps, Wi-Fi, and towels are included with your stay.